(File Photo) Ethan Ragsdale’s singles victory clinched the dual against Carl Junction. Ethan Ragsdale delivered a singles win over Samuel Hook 8-4, boosting Republic past Carl Junction in a 5-4 decision. The Tigers had to come from behind after losing two of the night’s three doubles matches. 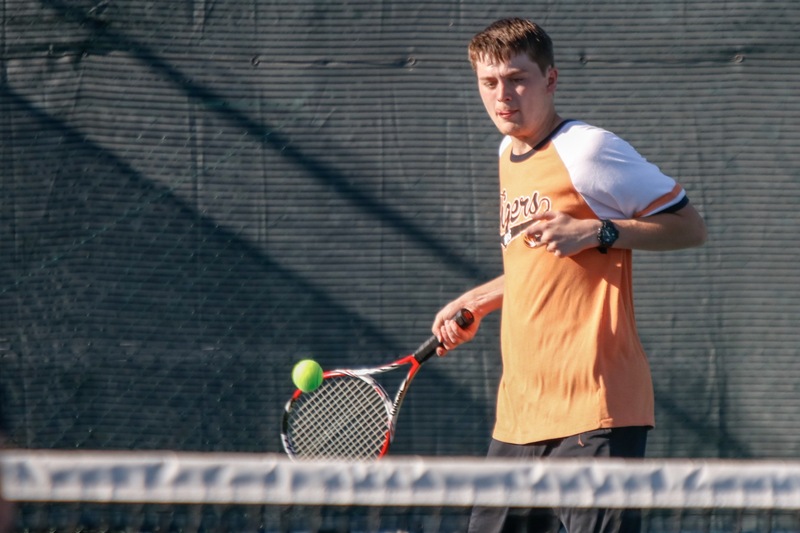 Carl Junction, with four returning varsity starters and a fifth starter who moved into the district during the off-season, seized a 2-1 lead by winning the #3 doubles match in a tiebreaker. Mason Fox and Samuel Hook edged Ragsdale and Drew McMillin 9-8 (7-4) to give the Bulldogs a short-lived lead. But in singles play, Republic got wins from Isaac Jordan, Jack Cook, and McMillin, before Ragsdale won the decisive match. The two doubles losses were the first of the season for Republic after going 24-0 in doubles play to start the year. Republic improves to 9-0 in duals this season, and 4-0 in the Central Ozark Conference.